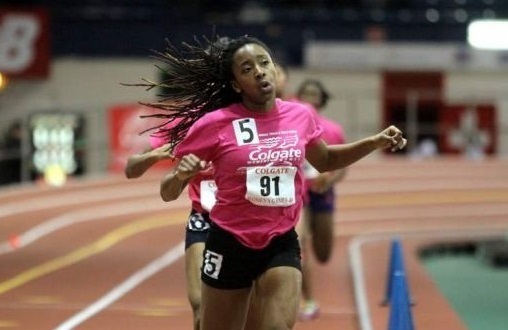 When Zola Golden as a junior at Arlington High School in LaGrangeville, New York, lowered her 300m personal best (PB) to 37.91secs in February 2014, her feat ranked her at the top in New York State and ninth on the US all-time list. But her impressive times didn’t just come out of the blue; the writing had been on the wall since she competed at the Somers Invitational Games in 2013. Golden’s quietly strong competitive nature coupled with determination has morphed her into a challenger who doesn’t take losing lightly. But the story of how and when Golden, 17, arrived at this juncture seems to be more one about destiny reinforced by passion and determination, winning over any other factor. Golden was first and foremost a dancer when she was younger. Dramatic photos of her leaping through the air indicated that she seemed headed in the direction of her mother, Belle, a personal trainer and teacher of African dance moves and tap. Then her father, Glendon, who has been following track before he was his daughter’s age, took her to the Penn Relays, and something happened; she discovered her true passion that she believes will one day take her to the Olympics as a competitor. “I don’t dance anymore,” Golden told TrackLife International,” Track pretty much took over.” After the Penn Relays experience of watching the professionals run, her desire to do the same continued to grow by massive strides. 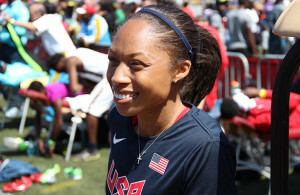 Today, American 200m star Allyson Felix remains the athlete she admires most for her professionalism. In addition, “Just watching other people run and seeing how they hit fast times pushed me,” she further explained. Indeed, it has, for she is dedicated to the sport and determined to win. Her fighter attitude does not allow her to retreat if she is defeated. This wickedly talented and powerful athlete began using starting blocks only in 2013, and though they might not be as crucial to starting the quarter mile as they are to the shorter sprints, her introduction to them, coupled with a new coaching routine, has opened up a whole new world for her. At this point, she is as talented in the 55m as she is in the 200m and 400m, yet she prefers the 400m because she finds there is more time in the race to correct errors. Just over a year ago (2013), Golden realized her potential when she competed at the Somers Games Invitational. She describes the experience as a “big meet for me” because she told herself that she could run with fast girls. Since then, she is always ready to take on the competition, no matter how fierce. While she has lost some and has won others, Golden has achieved one of three goals she has set herself. Prior to the end of the 2014 Indoor season, she attained the coveted All-American status in the 400m with a 54.17secs personal record (PR) as a second-place finisher at March 16 New Balance National Championships at the Armory Track and Field Center in New York. When the Outdoor season shifted into high gear, Zola Golden stepped up the pace; she raced to an impressive 52.82 at the May 8–10 Loucks Games in New York. That time became the new US #1 girls 400m mark. The curtain later came down on this gritty young athlete’s 2014 season in which she registered the New York state top time in the 400m (52.82), and top-ranking times in the 100m (11.78) and the 200m (23.99). Her feats have rewarded her with the 2013–14 Gatorade New York Girls Track and Field Athlete of the Year; she is the first athlete from her school to have received this honor. The 2015 season is approaching, and Zola Golden seems ready to take things to another level. AL: I had been monitoring her performances for a while [before]. The agreement was I wouldn’t get involved until the [high school] season ended. It was a matter of having a fresh start from the conditioning standpoint. TrackLife: What’s responsible for her big improvement in 2014? AL: It (the training) was about teaching her to move more effectively. She had great work capacity – all the natural ability and capability to be a great sprinter, but my idea was to get her to have a more interdisciplinary approach to training and competing. We first looked at her mobility and some of the things she did well. Clearly, she had strengths and weaknesses, so we trained her weaknesses in terms of her functional mobility strengths: her range of motion, flexibility, some areas of core strength that she had trouble with. She had difficulty with her IT band injury. We helped her understand recovery restoration and learn how to respond to the body and how to move more accurately, rather than [relying] on guess work. TrackLife: What event do you see as best for her? AL: She loves the 400m, and I believe her strength is going to be where her heart is. 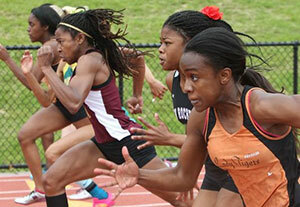 She can do the 200m, and she will continue to be successful there. Probably she will be able to out-perform many of the top 200m runners in the years to come. But she likes to fight, to do the boxing match associated with the long sprint (400m). It’s a chess match for her because it gives her more room to do what she wants. AL: She’s introverted; she started off being very quiet. She’s a lot like a good soldier. We had to teach her how to smile and that it’s okay to have fun doing the sport. The communication became open and clear when she started to enjoy herself more. She has a great sense of humor, but when it comes to business, she’s all business.